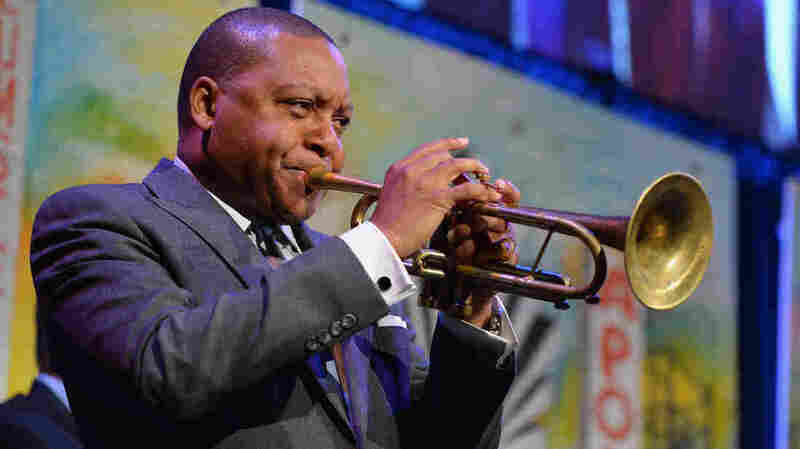 Wynton Marsalis' Concerto In D Makes East Coast Debut With Violinist Nicola Benedetti : Deceptive Cadence The jazz trumpeter wrote his Concerto in D for, and with, the Scottish violinist Nicola Benedetti. The two say the process was "fascinating" — but painstakingly slow. Wynton Marsalis onstage in New York in April 2016. His new violin concerto made its East Coast debut with the National Symphony Orchestra at the Kennedy Center last week. Jazz great Wynton Marsalis, a virtuoso trumpet player and Pulitzer Prize-winning composer, has written — wait for it — a violin concerto. At 55, Marsalis has spent a lifetime exploring the roots of American music. True, he admits, he has never played the violin, but he adds that if composers wrote only for instruments they could play, the world's musical repertoire would be pretty limited. Besides, Marsalis says, "I love the violin. I always felt that if you're going to write American music and use strings, you have to learn about fiddlin'." Especially if you look at the "slave tradition of fiddlin'." "A lot of slaves were fiddlers," he observes. "A slave that could fiddle was worth as much as a buck, even more sometimes." 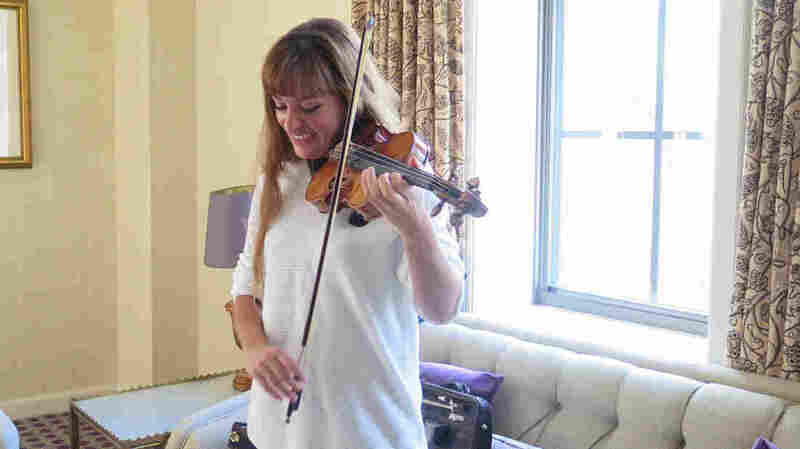 Some of the American fiddling tradition seems evident in the wild, hair-flying, foot-stomping style of the Scottish violinist for whom Marsalis composed his concerto, 29-year-old Nicola Benedetti. The two met when she was just 17, after he heard her perform. Now, after a two-year collaboration on Concerto in D, they're finishing each other's thoughts like a verbal fugue, with plenty of counterpoint — first one voice, and then the other, expounding on a theme. "I like her sound," Marsalis says. "I like the way she plays, and also I knew her. For me, most times when I write music, it's very personal. " "And I kept asking," Benedetti says. She kept asking Marsalis to write a piece for her, even though she wasn't entirely sure what she would get. "I can't say I had an idea. I was just quite sure it would be a good idea." Nicola Benedetti, prior to performing Wynton Marsalis' violin concerto with the National Symphony Orchestra last week. Marsalis knew he would learn a lot from Benedetti about writing for the violin. That learning came quickly — when he sent her the first page of his concerto. "When I first sent her the music," he says, "she was like ... man, you need to — this music is not complicated enough!" Benedetti was unsparing. "'I'm going to send you the first page of some of these concertos [Brahms, Beethoven, Tchaikovsky],'" he remembers her telling him. "'And you look at these pages to make your music look like this.'" He wasn't offended. "I knew we had that kind of rapport. I wasn't insulted by it," he says. Quite the contrary, he adds, it was a thrill to be asked to make something more complicated instead of more simple. The two worked together, often across transatlantic phone lines, for months on end. Benedetti would pick up her violin and put her phone on speaker — and across the Atlantic in the U.S., Marsalis would do the same at the piano. The work, she says, was painstakingly slow. "Note by note, 'Can you play an E flat with that C sharp?' 'Yes.' ... 'Can you play a D, can you play another C sharp?' 'No.' And it was also fascinating for me to see." After all, she says, "When do you ever get to see inside someone's composing process with that much detail?" "I always would tell her," Marsalis interjects, "if you want something different, it's not going to be that hard. I'll come up with something." And, Benedetti says, "the speed at which he comes up with 15 options for me is just unbelievable." The concerto is in four movements: "Rhapsody," "Rondo," "Blues" and the finale, called "Hootenanny." As critic Howard Reich described it, the piece takes "a largely populist approach, endowing the concerto with sweeping melodies, brilliant orchestration" and "many shades of Americana." Benedetti wishes Marsalis would call his piece something other than Concerto in D. "I think it's begging for a title," she says. "To me, the overall theme is the American story, the integration of cultures." That is "by far the loudest message," she says. Their disagreement over the title isn't the only conflict the violinist and composer have encountered. They might have achieved a mind-meld with the music — but they also fight. "Do we argue? Of course, we have very tense moments," Marsalis admits. "She wants me to change something. I don't want to change it. So I fight. She'll fight about it." And the thing they still have not stopped fighting about is the piece's ending. After a raucous, rapid-fire, rhythmic last movement, the finale is a fade-out. "It goes into a kind of wistful dance of something, ancestral memory," Marsalis says in an ethereal tone. Benedetti is having none of it. "It disappears," she mutters. Marsalis, with a tiny grin: "She doesn't like that." It's a conflict between the intellect of the composer and the dramatic sense of the performer. "My concern," Benedetti says, "is not from sort of intellectual standpoint. It's how I understand violin concertos to be perceived by the audience." In short, she wants a big ending, an exclamation point, something that will make the audience stand up and cheer. For now, Marsalis is resisting. So is this concerto finished now, or is it a work in progress? "I never finish any of my music till I finish it," Marsalis says. "I don't rush to finish it. I'm not competing with anybody. I wrote it for her. If she says it's not finished, I'll work on it some more. "If I feel it's not finished, I'll work on it until I die."